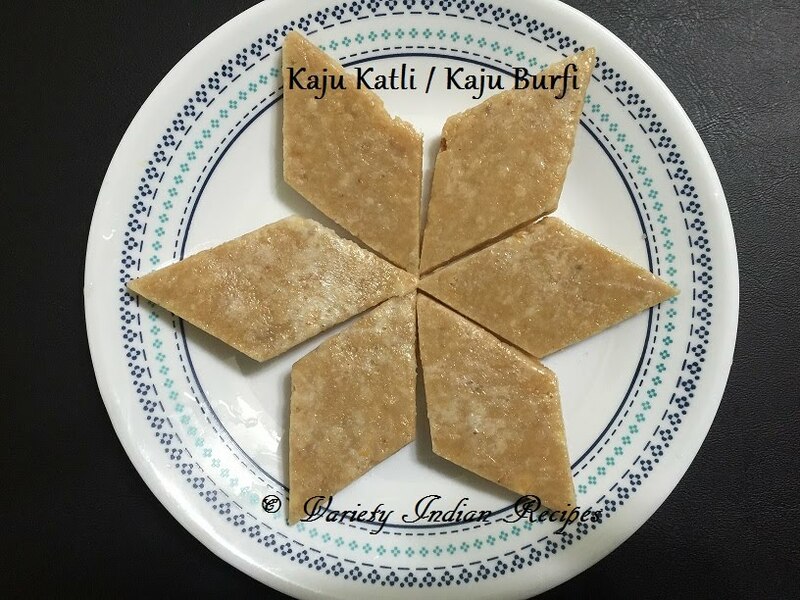 Kaju Katli / Kaju Barfi is a rich and splendid Indian dessert. This sweet is made using cashewnuts and sugar giving it a delicious taste. Powder the cashews in a dry grinder. In a pan mix sugar and water and bring to a boil. Add the cardamom powder and stir well until the sugar dissolves. Allow to boil until the syrup is sticky. In a low flame add the cashew nut powder and stir well. Keep on stirring until the mixture starts to thicken. When the entire mixture comes together like a dough, turn off the flame. When it is still warm knead the cashew dough. Take 2 pieces of butter paper, and grease it with butter or ghee. Add the cashew dough on one paper and cover with the other. Roll the dough using a rolling pin until you reach 4 -5 mm thickness. Cut the dough into diamond shape. Separate the pieces and store in air tight container.